This extensive Wudang complex of remarkable palaces, temples, pagodas and nunneries is constructed on the slopes, cliffs and peaks of the verdant Wudang mountain scenic area. 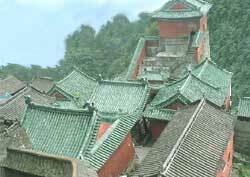 Wudang mountain has long been linked with Taoism and is the holiest of China's Taoist mountains. Spring and fall are the two best seasons for exploring the Wudang building complex and scenic area. The Wudang version of Kung Fu martial arts has been known and respected throughout China for centuries. It is now world famous, thanks to the global exposure of the above mentioned movie. That natural setting is so photogenic that it was chosen for background scenes for the internationally acclaimed movie "Crouching Tiger, Hidden Dragon".